If you are looking for a play pen that is spacious, stimulating and attractive, then you don’t need to look farther than the Baby Playpen by Best Choice Products. 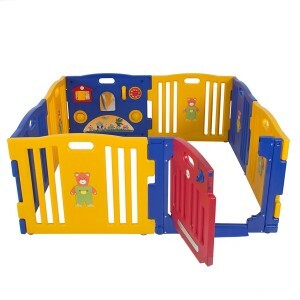 Available in two designs for boys and girls, this playpen is surely going to amaze your child and give them hours and hours of fun playtime inside. The classic combination of pink, purple and yellow for the girls or the fun blue, red and yellow one for the boys – both designs are attractive and stimulating, and will fit with any décor in your child’s room. The spacious room inside the playpen with give your small or bigger children hours of fun time in their own kingdom, amongst their own favorite toys and books. This quality product is suitable for any child up to 4 years old, whether they are active or quiet in nature. 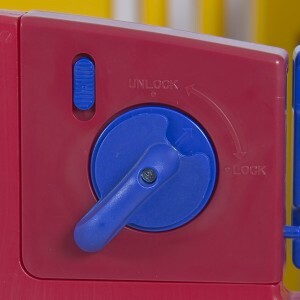 The activity board inside the playpen consists of a mirror, a dial-up phone and ball spinners that would seem interesting to any child. Beside the activity board, there are a number of stickers of friendly teddy bears that need to be placed around the playpen so that your child will feel that they are surrounded by their friends. The stickers, just like the playpen, are colorful and attractive, and will surely be liked by the children. There are a total of 8 panels in the playpen that makes it a large and spacious one. There is ample space inside the playpen for your infant child to sleep or crawl around, as well as for multiple children – or adults – to sit down and play. 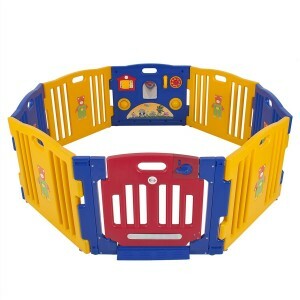 The dimension of the Baby Playpen is 32 inches X 25.5 inches, with 12.5 inches in height. Toddlers will be able to stand up by supporting themselves on the walls of the playpen and look over it if they want to. The gender-specific color of the playpen allows parents to buy the one of their choice for their child. The material is lightweight and can be carried anywhere. Another great advantage of this playpen is its size, which is large and gives the child a lot of space to play comfortably in. Sometimes parents prefer to make the playpen smaller by only adding 4 or 6 of the panels instead of 8 if they have a shortage of space or are travelling somewhere. Due to the material of the playpen being light plastic, it is hollow on the inside. Therefore, although the material is sturdy and long lasting, it can be easy for the children – beside the adults – to move the playpen from one place to another. Besides, an older child can cause one side of the playpen to topple if they want to climb over the wall, which is relatively lower at 12.5 inches.